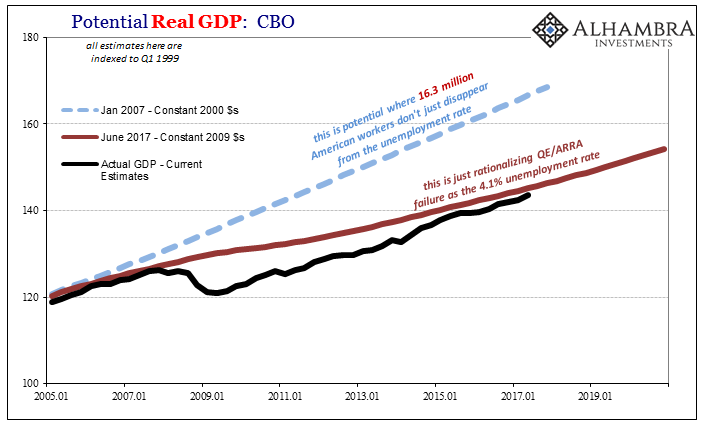 The worst aspect of this economy is by far the real effects pressed upon especially American workers. Of that there is no doubt, including young adults who would be working rather than “studying” if the economy was at all like it has been described. The second worst part is watching politicians trade their descriptions for whomever occupies the White House. 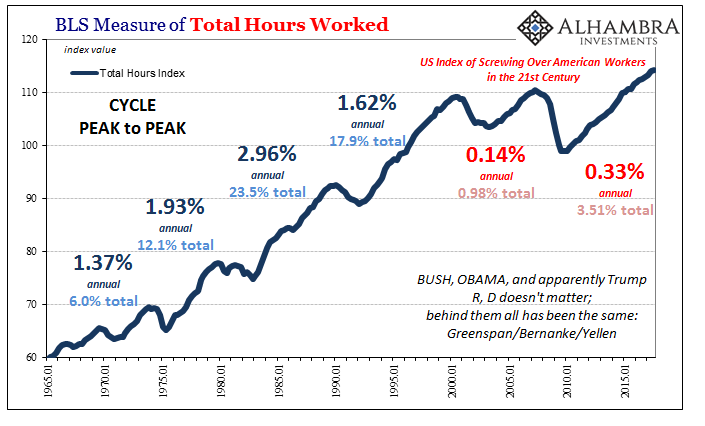 It does nothing to advance the cause of the American worker (or the global economy for that matter). The terrible jobs report that just came out … you can see phony numbers, 5 percent. Trump is right. The stock market is doing very well. But many — if not most — people of color in the United States aren’t benefiting from what Trump points to as proof of a thriving economy. Even among those who own stocks, regardless of race, there’s great inequality preventing most Americans from experiencing the prosperity Trump described. However you ever look at it we’ve created a lot of new jobs, we may hit 2 million for the calendar year, we’ll probably be just under 2 million for the calendar year. That’s Labor Secretary Alexander Acosta’s sudden embrace of the BLS, predictably cheery about what’s expected to be “the lowest unemployment rate since the 60s” next year. It was phony last year but now it’s unassailable progress? Of course not. Politics isn’t the art of the possible anymore, it’s the distorting of everything to make whoever’s in the Executive office look as good as possible. Two million new jobs in 2017 on the surface sounds terrific, but it’s not; it’s unambiguously terrible, about half of what would be solid, just as it was in 2014 when there were more jobs (according to the BLS) created in that particular calendar year. Though it will be described as the best jobs market in decades, the truth is that it continues to be the worst no matter which party holds the government. 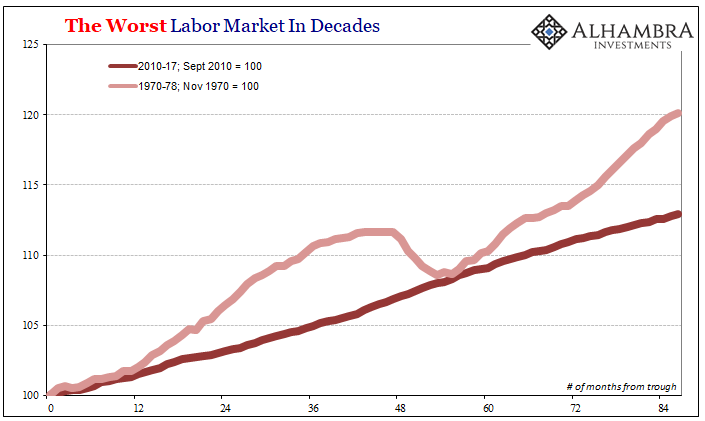 As of the last payroll report, the BLS figures that the labor market has grown in each and every month since September 2010 (the month QE2 was announced).  At 86 months, that is purported to be a record for expansion in US economic history. It sounds very impressive, as if the length of advance is at all important next to the scale. 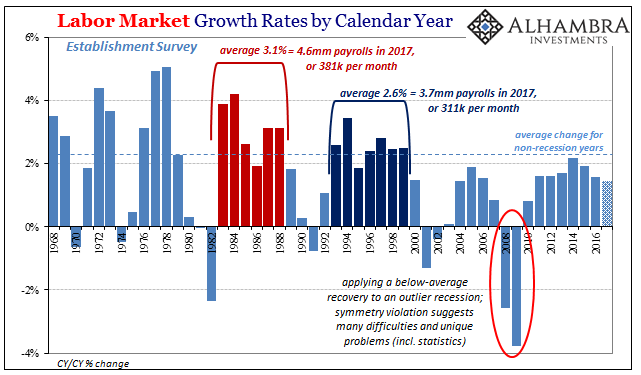 If we compare, however, the last 86 months with any other 86-month stretch including those from the 1970’s we see that it doesn’t matter at all how long the jobs market is growing. What does is the rate of expansion during those months. 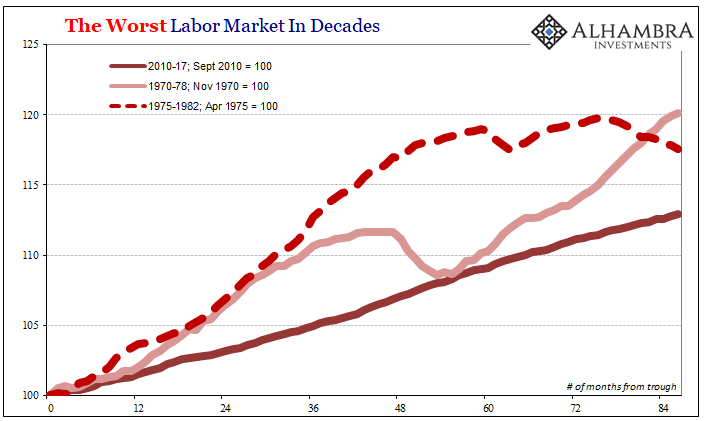 Consider that from 1970 to 1978, the labor market (in appropriate percentage terms) back then vastly outperformed the current one even though there was a nasty, severe recession right smack in the middle of that time period rudely, seriously interrupting that expansion. And that wasn’t exactly taking place during a banner economic trend in American history. The Great Inflation was far better for employment including recessions than what’s being called today varying shades of booming without another one. And it doesn’t matter where you start your comparison; above I’ve begun the 86 months starting at the bottom of the 1973-75 recession. 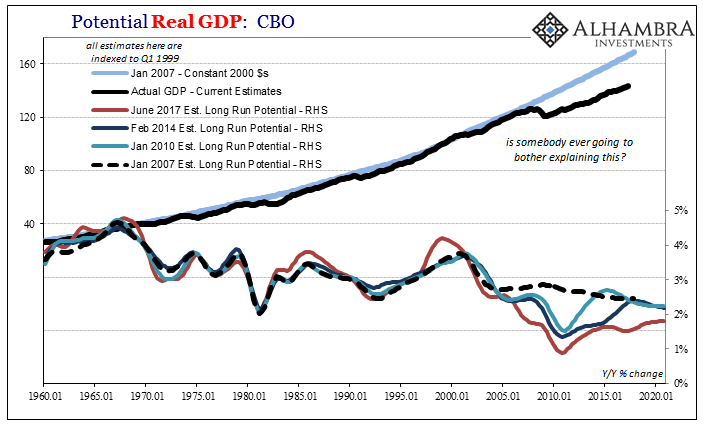 This time, it ends in the middle of an even worse economic contraction in 1982, where despite the serious double dips of the early 1980’s taking up the final two years of that period it still significantly outdistances this “record” expansion of the 2010’s. Candidate Trump was right; it’s all fake. What Secretary Acosta should have said was more along the lines of Republicans’ previous criticisms. “The labor market made some progress this year but it was far short of what is required to get American labor back on track and moving toward the actually healthy and robust economy we promised during the campaign.” That sort of honesty could have allowed (or not) politicians of both parties to come around to a more forthright assessment of the current predicament, instead of each one taking turns denying that we are deep inside of one and getting deeper by the year. This is, sadly, after ten years still Step 1. They have to first agree that the economy is bad, was bad, and is in all likelihood going to stay that way. That sort of frank assessment has to happen before anyone can really go about figuring a solution to it, let alone implementing it. If you won’t admit there is a problem, or if you won’t admit it while your guy is in the White House, you’re never going to be amenable to fixing what you can’t ever claim is broke. It’s not a specific failing of one party or the other, it’s a character flaw of both sides brought on by modern politics. It’s the very one the Fed exploits so as to be unaccountable for anything and everything. There is a reason why especially populist dissatisfaction has tended to take on anti-establishment or anti-elitist proportions.